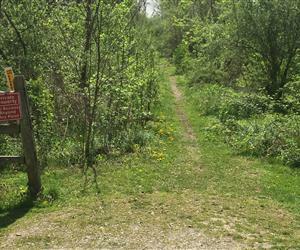 This trail is located on Stormont Street in New Concord next to the New Concord Elementary School and ends at the East Muskingum School Complex on John Glenn Road. The almost 3.5 mile trail has a hilly terrain with concrete sidewalk, grass, mulch and asphalt surfaces and winds through downtown New Concord, the Muskingum University campus, and a wooded area leading to the New Concord Pool and the East Muskingum Schools complex. Dogs permitted if on a leash or can be controlled by owner. All necessary shots must be up to date. Owner responsible for waste clean-up. Trail includes Friendship Lake, which is open to the public during daylight hours. Fishing is permitted for all East Muskingum School District residents with a valid State of Ohio Fishing license.